Your first paragraph ...This die cut card uses one of Spellbinders Dies called the Fancy Tags Three. I especially like the first one on the package picture. This is a Happy Mother's Day card - simple to make and since I used one of the Garden Girl Collection patterned paper from Bo Bunny which has a dominantly shocking pink colour theme, I'm just following the same colour theme and adding shocking pink ribbon and card-stock. Just click on image for gallery or expanded view. Below is how I did it step-by-step. Hope this die cut card will inspire you to use your Spellbinders dies to make quick and easy Mother's Day cards for Mother's Day. This is especially useful when you have to make a whole batch of them for clients or Happy Mothers Day events. 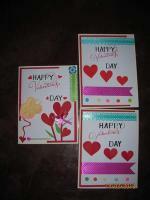 Pick up the dominant colour in your patterned paper and use that as the colour theme for your cards. Shocking Pink Color Cardstock - 4" x 2.5"
If you don't have the the patterned paper, just use one that has a border pattern at the bottom or you can create your own border and attach directly to the front of the white cardstock. Fold cardstock to make blank portrait card. 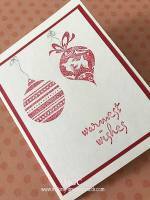 Apply adhesive to patterned paper and paste to front of blank white card's front with the border pattern below. 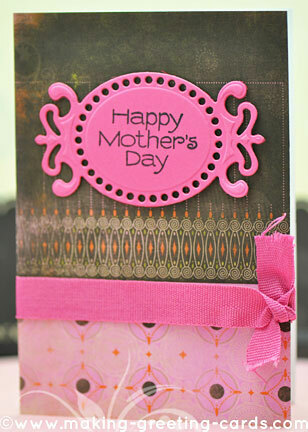 Ink message stamp 'Happy Mother's Day' with black pigment ink and stamp on centre of shocking pink cardstock. 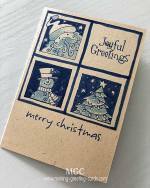 Follow Spellbinders Die Cutting Instructions for cutting and embossing the die cut. 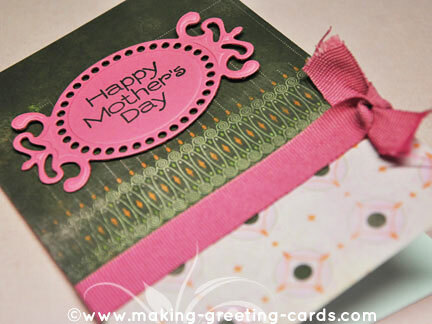 Make sure the 'Happy Mother's Day' stamped message is centred on the pink cardstock before you cut it. 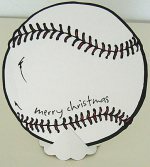 Attach to top of card front with foam double sided tape for a 3D effect. Snip a small cut on the card at the folded line at the border pattern just enough for the ribbon to go through. Thread shocking pink color ribbon into the slit, fasten with glue or adhesive inside and outside of card and tie at the edge of card. That's it! So simple, right? If you are making a whole batch of these die cut greeting cards, just cut all the pieces at one go then sit down comfortably to assemble them. That will be easier on your feet:-) Make yourself comfortable and have fun making this Happy Mother's Day die cut greeting card.